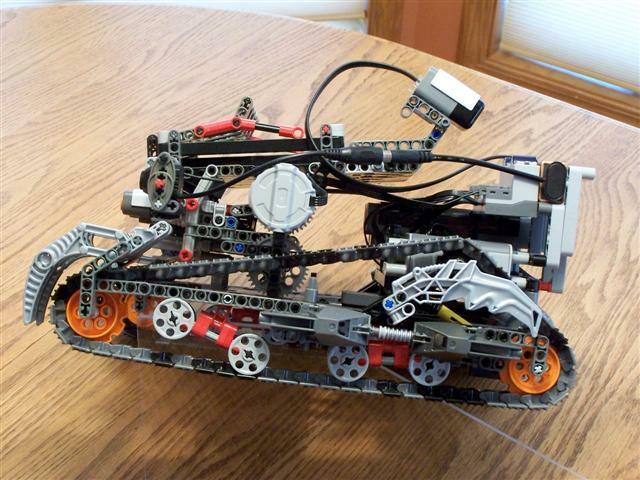 OGRE is an autonomous robotic “tank” based on the NXT and built entirely out of unmodified LEGO. What started out with wanting to mount a “Hailstorm” class Zamor launcher onto a mobile platform ended up being a far more entertaining and interesting project. This is the logical (or perhaps I should say "obsessive") conclusion to a series of robots I've played with for a while, ever since the first person put a Zamor launcher on an NXT robot. The original Hailstorm nested four launchers (each 3 studs wide) in a space just 12 studs across, the tightest nesting I could figure out. Powered by a single motor, this array could crank out a little over 9 spheres a second, and speeds of more than 4 meters/sec (about 9 mph). The result on loosely “piled” (not clutched together) brick-built structures is devastating; thin walls look like they explode as the sphere impact them, and thicker walls are torn down only slightly slower by the sustained volley of fire that can empty the 40 sphere magazine in under 5 seconds. It was named “Hailstorm” because of the sound of the spheres smashing into any target in the way. While this was amazing to watch, ultimately it wasn’t very flexible; as a fixed structure it had no ability to track or elevate to direct the spheres. First I tried to mount the launcher on a pan-and-tilt turret, and found that this really didn’t work too well. The resulting turret was large, large enough that it needed large flat smooth surfaces to act as bearings. And even then, elevating it didn’t work well because it could only feed spheres in at a certain angle. So I changed tactics, and mounted a fixed launcher in between two large triangular treads. Instead of the tall ungainly vertical “stack” ammo magazine on the original Hailstorm, I designed a long slightly sloped “tray” to feed the launchers. To prevent spilling I added a small flip-up guard over the front of the tray, and I replaced the NXT motor with a more compact XL PF motor. The launcher was ready to go. 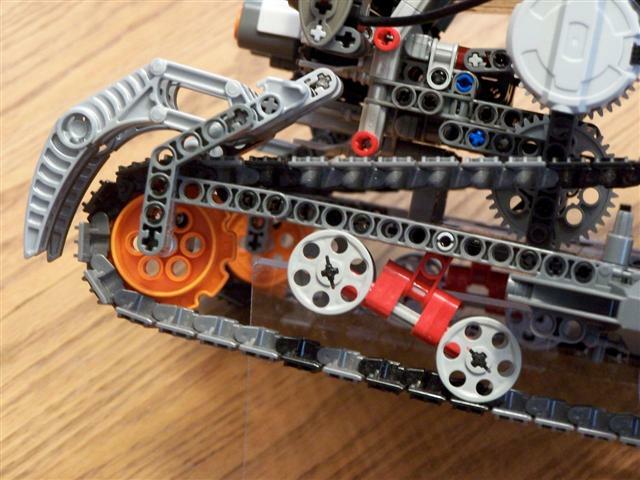 The tread systems were identical; each side has 55 tread links, driven by a large cog in the rear of the robot. By having the treads driven at the rear, it kept the bottom of the treads under tension while rolling forward, preventing the treads from skipping or risking breakage on rougher ground. When backing up, the treads would also need to be tensioned, which was done by putting the small cog at the “point” of the triangle on a spring-loaded arm. The LEGO shock would push this small cog up into the tread, thus taking up any slack in the system and maintaining tension. Such long treads also needed some support along the length of the system, so four small “carrier bogies” on two separate mechanisms help carry the weight. The tread assemblies are connected by two beams: one in the back incorporating the PF motors, and another near the middle to support the Hailstorm launcher. With the launcher balanced on top of the forward beam, and the PF battery box, IR receivers, and NXT tucked in the back, the basic bodyplan of Ogre was completed. 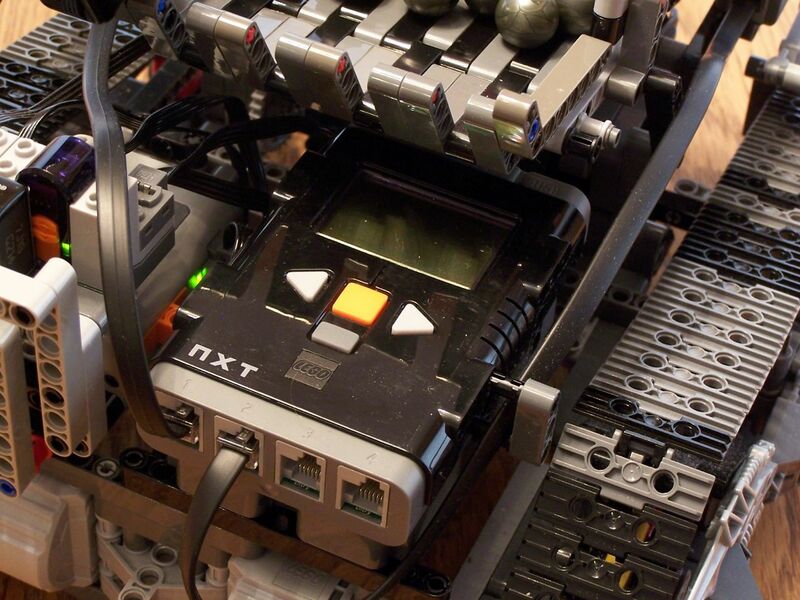 No NXT motors were used; first, there wasn’t any reason to use their built-in encoders, and second they were too big. And with the gray motors, and various grays and blacks structure, using the new Black NXT was natural – it completed the color scheme perfectly. The NXT controls the tank through the Hitechnic IRLink, and uses only a single sensor, and US sensor near the front of the tank to allow it to “see” potential targets. Since the IRLink can control the PWM of the PF motors, turning (under control of the NXT anyway) can be very precise and controlled. 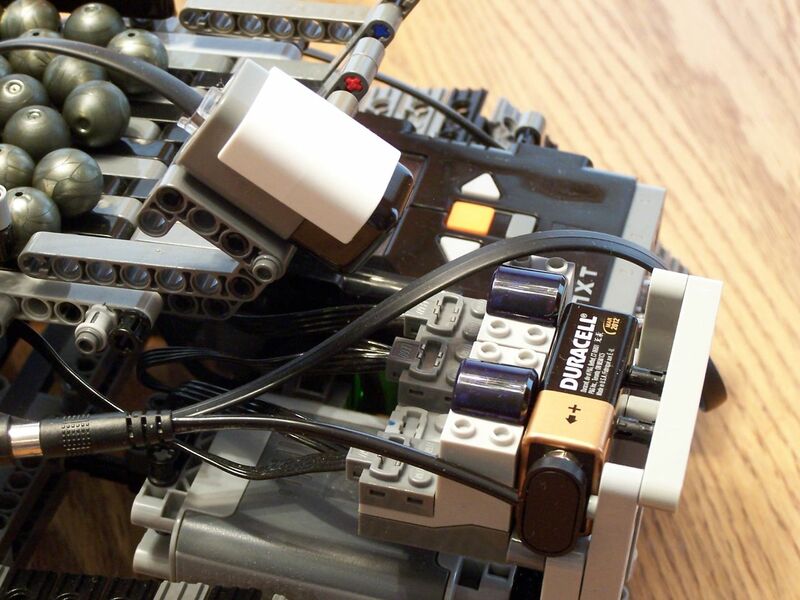 Using only PF motors had another benefit; using two PF remote controls the all three motors could be commanded completely separately from the NXT, allowing a “dumb RC” mode along with the “smart autonomous” mode. Along the other side of the tank I put a small 2.4 GHz “spy cam” to allow an “Ogre eye view” of the field of battle (not connected to the NXT, just to send back an image to a TV screen). Under remote control the vehicle can be steered and the launcher fired at the same time; watching the vehicle’s progress on the TV intense, as the whole viewpoint rocks violently as the launcher kicks into high gear. But at the heart Ogre is a robot, not an RC vehicle. Under control of the NXT, Ogre rolls forward a preset distance and then stops and begins a slow turn in place, looking for any US sensor return that shows an object closer than the initial distance. Q: Where can I buy this? A: You can’t. While everything here except the camera is unmodified LEGO, this is not an official LEGO set. 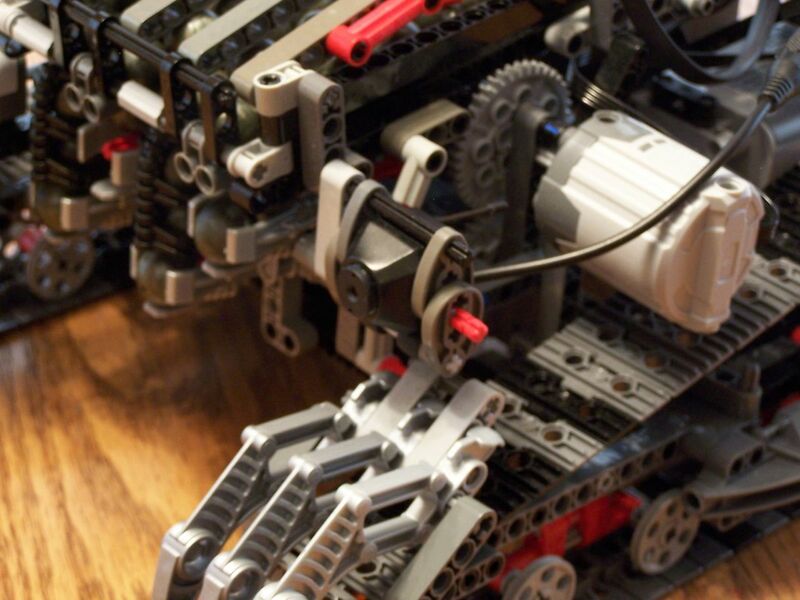 You could certainly manage to build it yourself from parts bought from LEGO and other places. Q: Do you have building instructions for this? Q: Where do you get the treads / shooters / ball thingies? 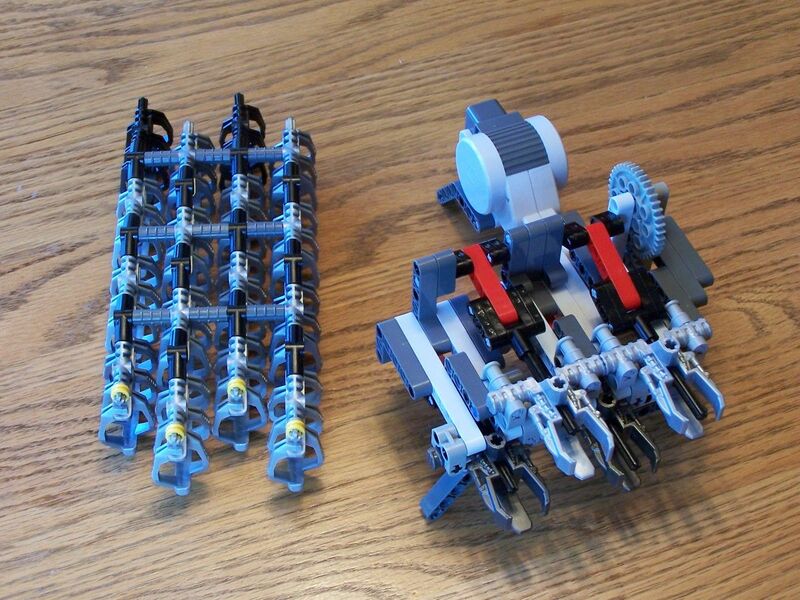 A: The treads recently came out in a number of sets, and are sold through LEGO Education as well. 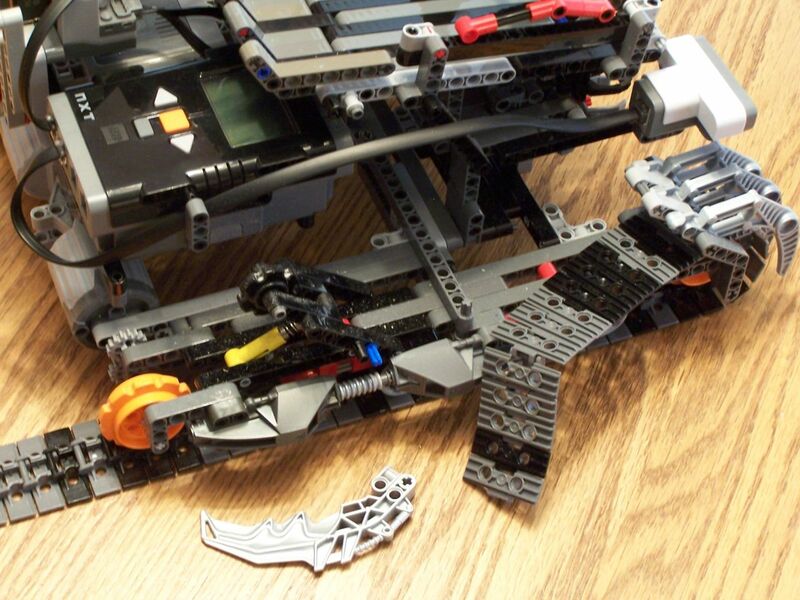 The shooters are Zamor launchers, and came in older Bionicle sets as well as a few newer ones. 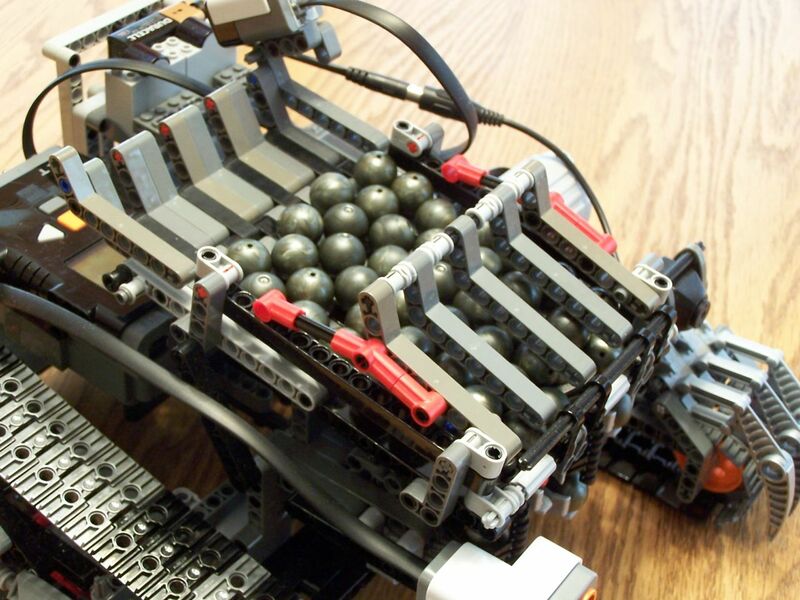 Likewise the “ball thingies” aren’t milk duds, or paint balls, or marbles, but Zamor spheres (also from the Bionicle LEGO line). Q: Where did you get the Black NXT? 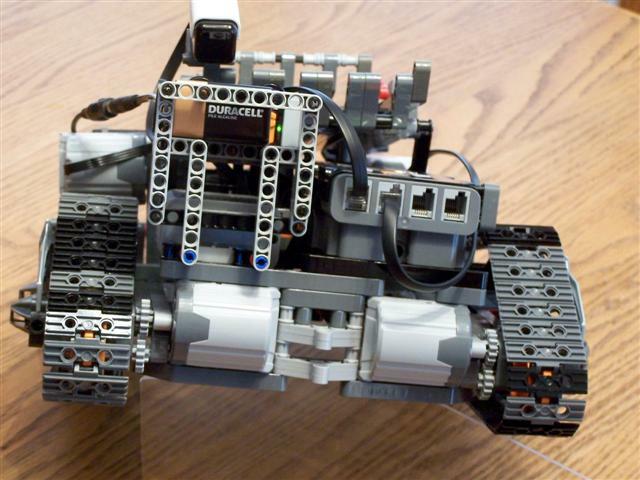 A: The Black NXT is being released by LEGO in a limited distribution: 1998 units sold through LEGO Shop-at-Home and Amazon, to commemorate the 10 year anniversary of the MINDSTORMS line. For a while, they can be ordered from those outlets. Q: Where did you get the tiny camera? A: I ran across it in a hobby shop in Maryland (about $90 if memory serves), but I’m sure you could find something similar many places on-line. Mine is fixed frequency (no need for fiddly tuning of the receiver) in the 2.4 GHz range, which worked beautifully after I unplugged our cordless phone. Live and learn. Q: In your video the LEGO bricks are loose – they aren’t pressed together! No fair! A: Yes, I know they’re not pushed together. Ogre (or, more accurately, a LEGO Zamor launcher) doesn’t pack enough of a “punch” to take apart a well-built LEGO structure (I’m tempted here to try it on other brands of brick-like building toys, upon which it might do better). Not too surprising, given how well-constructed LEGO is. Q: Will it fire other things? A: No. The way the launchers work they need a small hard sphere of a very specific size. The Zamor spheres work. I’ve yet to see anything else work in them, LEGO or otherwise. Q: Can it pick up after itself? A: Not yet. 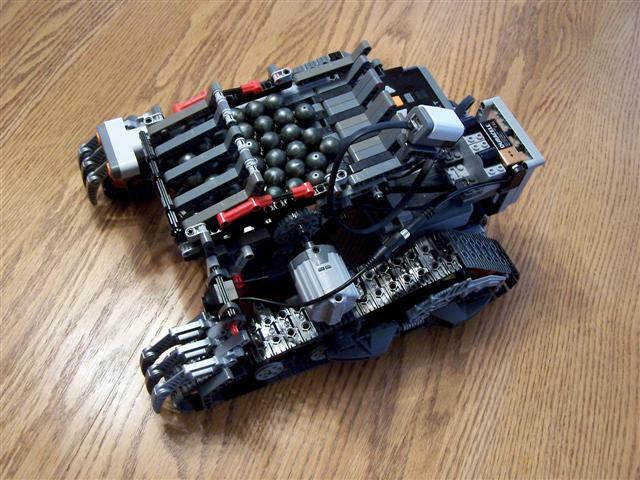 It shouldn’t be impossible to build a “sphere scooping” robot to reload Ogre, but I’ve not done it yet. 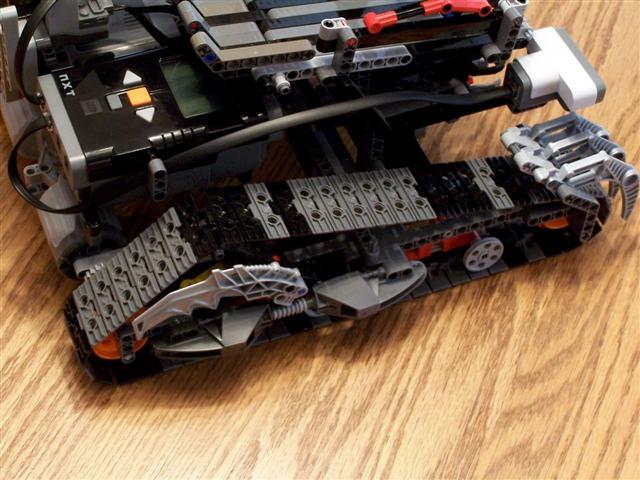 NO, LEGO doesn’t make tanks. 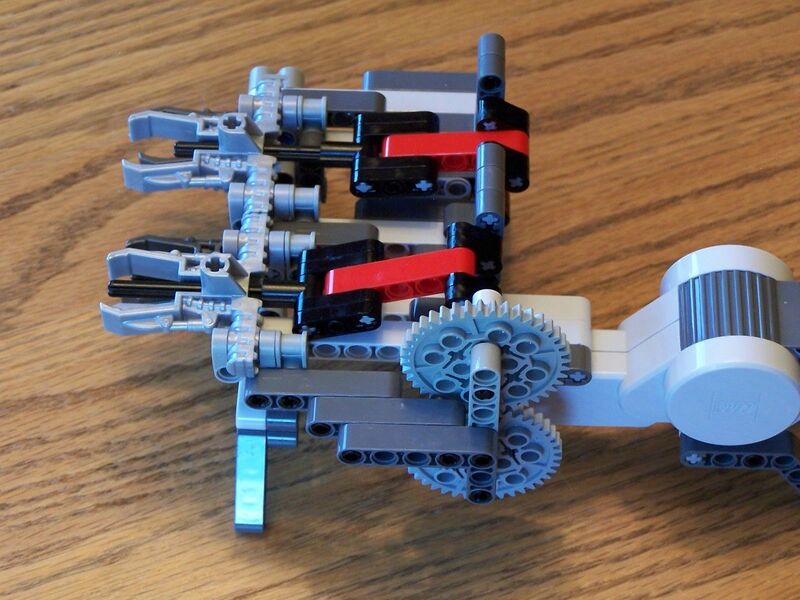 But with LEGO parts, you can make just about anything you can possibly imagine. Thanks Jutta. Wherever you are ?.